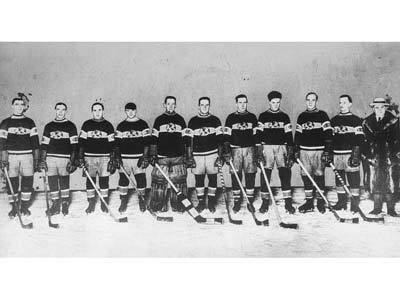 The 1924 Stanley Cup Final saw the National Hockey League (NHL) champion Montreal Canadiens defeat the Western Canada Hockey League (WCHL) champion Calgary Tigers two games to none in the best-of-three game series. It was Montreal's fourth appearance in the Final and second championship. The first game was played in Montreal and the second game was played in Ottawa, to take advantage of the artificial ice. A rookie forward named Howie Morenz scored a hat-trick in game one and a further goal in game two to lead the Canadiens. The 1923–24 Montreal Canadiens season was the team's 15th season and seventh as a member of the National Hockey League (NHL). The Canadiens once again returned to the playoffs and won their second Stanley Cup defeating the Calgary Tigers. The Montreal Canadiens defeated the defending Stanley Cup champion Ottawa Senators 5-2 in a two-game total-goals series. Out west, the PCHA second place Vancouver Maroons defeated the first place team (Seattle Metropolitans) also. Meanwhile, in the Western Canada Hockey League, the Calgary Tigers won the regular season and the playoffs. The Canadiens owner, Leo Dandurand, wanted Calgary and Vancouver to face off against each other and then have the Canadiens play the winner for the Stanley Cup. Frank Patrick, the president of the PCHA, refused to go along with that idea. After sweeping Vancouver, Montreal's next opponent was the Calgary Tigers. Montreal swept them too in a best of three series. Howie Morenz was the star, scoring a hat trick in the first game, then another goal in the next game, which was transferred to Ottawa because of the slushy ice at Mount Royal Arena. Morenz was levelled by Cully Wilson of Calgary and suffered a chipped collarbone, but it was all in vain as Montreal won. The Canadiens swept all three teams they faced during the playoffs en route to their first Stanley Cup since their 1916 Cup win as a member of the NHA. In order to claim the Stanley Cup, the Montreal Canadiens needed to defeat both the WCHL Champion Vancouver Maroons and the PCHA Champion Calgary Tigers. Billy Boucher scored three of the Canadiens' five goals, including both game winners, to eliminate Vancouver. And versus Calgary, Montreal's 21-year-old rookie Howie Morenz registered a hat-trick in games one and two as the Habs completed the sweep. Game two of the final series was played in Ottawa to take advantage of the artificial ice surface. Having finished atop the regular season standings three years running, the Ottawa Senators were heavily favored to get past Montreal and challenge for the Stanley Cup once again in 1924 but that spring, as sometimes happens, the experts were wrong. After riding a Vezina shutout to a one-goal lead in the two-game, total point series, the Canadiens took the final game 4-1 and were on to the next level, facing the western Canadian contenders for the Stanley Cup. First up were the Vancouver Maroons who, like Montreal, had toppled a first place favorite to move on to the best-of-three series. Coming out the right end of 3-2 and 2-1 decisions, both presented before home town fans, the Canadiens overcome the stiffest opposition they would face in the 1924 postseason. Calgary’s Tigers represented the final opponent standing between Montreal and their first Stanley Cup title as an NHL team. Once again it was Montreal in a sweep. Game one, a 6-1 blowout featured a Howie Morenz hat trick while the second and final match, played in Ottawa due to inadequate ice conditions in Montreal, ended as a 3-0 Canadiens victory with Morenz, Joliat and Boucher sharing the scoring honors. Captain Sprague Cleghorn managed to curb his enthusiasm for mayhem on the way to first Stanley Cup as an NHL team, picking up four postseason points but only two minutes in penalty time.